Ever find yourself needing to know, on a moment’s notice, how many calories you’ve eaten in a day? Or how much saturated fat you’ve consumed? Or how many more grams of potassium you need to reach your recommended daily allowance? There’s a badge for that. 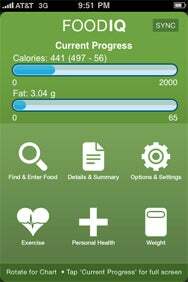 Caloric Quality: Get a thorough picture of your daily nutritional intake with Food IQ. Food IQ for the iPhone or iPod touch lets you choose any one of 18 nutrients to assign to the app’s icon badge so you can check your daily intake just like you’d check for unread e-mails. Granted, you may not care how many grams of Vitamin B-12 you’ve had in the past 12 hours, but surely somebody does. Leave it to a developer with a name like Obsessive Code to cater to that person. But there’s obsessiveness for everyone here. Not only does Food IQ allow you to keep a log of every morsel you eat and a detailed nutritional breakdown of those morsels, it also lets you track your exercise, your weight, your blood glucose level, and even your medications. It’s a hypochondriac’s dream (or nightmare). Progress bars show you today’s information. Rotate the screen to see a graph of your data going back as far as four weeks. At the heart of things is a database of more than 7,200 foods—including standard grocery items, soups, pre-packaged entrees, and even choices from popular fast-food outlets—all with requisite nutritional information. Anything you can’t find in the database you can add yourself, including your own recipes. Similarly, there’s an extensive, customizable (and esoteric) database of exercises. Whether you’ve been jogging, housecleaning, butchering animals, or repairing an airplane, just a few taps will reveal how many calories you burned while doing it. Food IQ’s previously abysmal interface has been revamped for the current version, substantially improving usability—although some of the non-standard elements may be a little slim for the more full-fingered user. A companion Web site provides a nice overview of the app’s features as well as a backup service, though a monthly fee is involved. Entering a custom item into the database is fairly painless, but if you eat a lot of what’s not already in there, tedium can set in. And restaurant meals will leave you making wild guesses, unless you can get the chef to tell you just how much butter went into those mind-blowing mashed potatoes. But if you’re as pathological about your health as Food IQ lets you be, you probably don’t spend much time in places like that anyway.